I found this recipe in the October issue of Food and Wine last month, contributed by Portland chef Naomi Pomeroy. We've made it twice now, and it has become my older daughter Gianna's favorite chicken dish. My variation was made with limes and peeled garlic instead of lemons and the halved head of garlic. Pictured below is the halved version of the recipe. Now that my husband is back at work in Alaska, meals at home will be more geared towards my own taste. When he called to let me know they wanted him back, I immediately dropped the slow cooker cookbook that I'd been reading, and dove right into Bon Appétit. While he likes thin fried pork chops and spaghetti on a regular basis, I prefer to experiment with new dishes that are generally more blog worthy. "What do you think about your dad heading back up for 4 weeks?" I asked Gianna. "I am starting a show about my life when I get older!" she said. "Like The Goldbergs?" "YES!!!!" We had just left a restaurant where the hubby was his usual animated self expressing every thought that came to mind, pretty much on a rampage, while I sat without hiding my discontent and total dissatisfaction for the bad service that we were receiving. "Are there hidden cameras?! Are we in a reality show that I don't know about? Is that why you guys act the way you do?" I play dumb, driving, as if I have no idea what she's talking about. Gianna started to imitate us to prove her point, which provoked knee - slapping laughter. (Dad's like THIS... and then YOU'RE like....) Although extremely pleased with the personality that she's developed, and bewildered that I gave birth to this child that is 5 inches taller than me, I looked at her and said, "No more Black Rock for you." Then I switched Sirius to the Lithium channel, which provoked big UGH's from both of my daughters. We're big fans of this dish. Thanks to Food and Wine and Naomi Pomeroy for sharing! 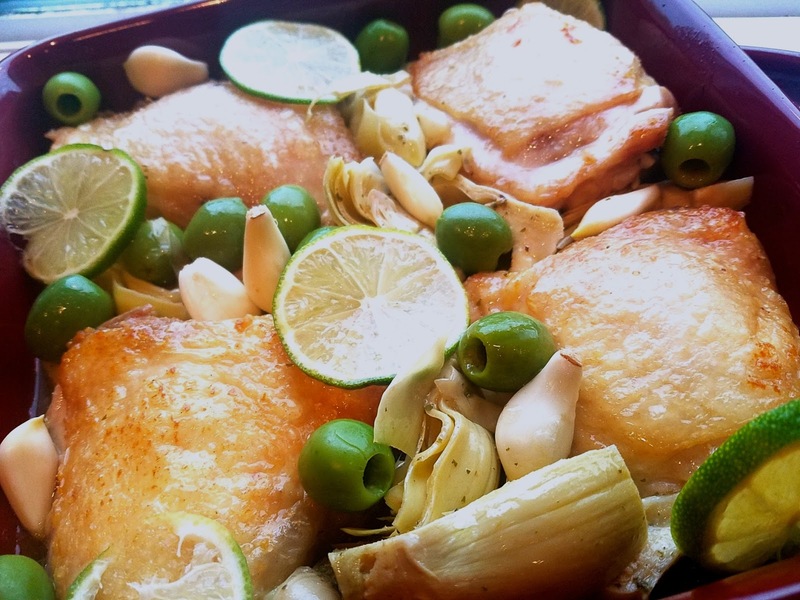 The original recipe can be found here: Braised Chicken Thighs with Marinated Artichokes.